The AT1001 Full Duplex Wireless Gate Intercom provides crystal clear two-way audio communication with simultaneous talk and listen, just like a telephone conversation. It has a direct line of sight range of up to 4,000 feet. The AT1001 has excellent interference immunity from other wireless devices. Its wire-free installation avoids costly trenching and it is designed to easily utilize solar panels for power in remote applications. A power supply is included with the inside base station, and the outdoor callbox. Alternatively, the outdoor unit can be powered by a 12 volt power source like a solar power system or vehicle power. There are two relays or switches inside the Outdoor unit that can be used to activate a gate or door opener, turn on a light, ring a bell, or whatever you want. In Figure 5 you see to key icons on the base station. These are used to activate the relay. If you have multiple Outdoor units, only the relays on the unit calling in are activated. Up to 9 outdoor call-boxes can be on the same radio channel and you can have as many indoor units as you wish on the same channel. The indoor units DO NOT intercommunicate. 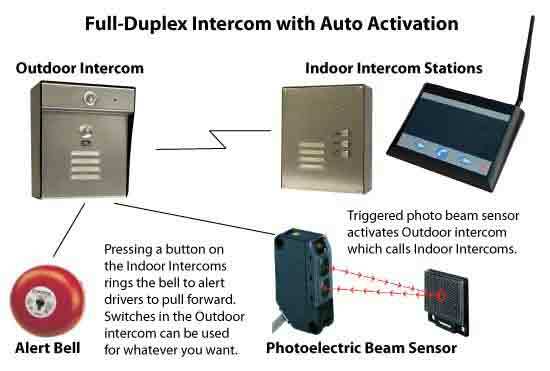 Any indoor unit that answers a call first is the only one communicating with the outdoor callbox, no other indoor unit can be on that conversation. However, there is one possibility if more than one indoor unit answer a call at the exact same time then they're able to talk/listen to the call-box that made the call. Attractive indoor enclosure "desk top unit"